Purpose: The purpose of this article is to help you think about negating statements so that you can apply the negation test for CR assumption questions. In this article, we will look at how to negate using the set theory approach for negating statements. This article is a pre-requisite to our free session on “Prethinking for CR assumptions”. In addition, do not forget to register at e-GMAT to attempt a free quiz on negating statements. Introduction to Negation: In this section, we will briefly talk about what negating a statement means and why is it important. If you feel, you lag behind in the planning part of your preparation, we invite you for a free webinar on GMAT Strategy. Learn the best way to prepare for GMAT by taking a free trial of our online GMAT preparation resource. You can write to us at acethegmat@e-gmat.com if you need any GMAT related advice. What is negation and negation test? To understand the above let’s take a simple argument. 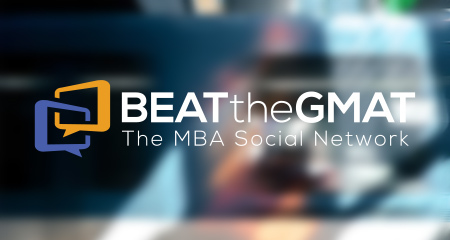 Every super-smart GMAT aspirant registers on BeatTheGMAT. Hence, every Harvard admit is a registered student at BeatTheGMAT. Assumption: Harvard only admits super-smart GMAT aspirants. Why does negation test work? The correct answer choice is like a missing premise. Which means that has to be true for the conclusion to hold true. This implies that the negated version of the correct answer choice will shatter, falsify or invalidate the conclusion. Hence, once we have narrowed down our answer choice(s), we can verify it by evaluating whether the negated version really shatters the conclusion or not. If it does, then your selected choice is indeed the conclusion, otherwise not. Harvard does not only admit super-smart GMAT aspirants. At least one Harvard admit is not super-smart aspirant. Ok, sounds good. But the next question comes to mind. When you think of negation, it helps to think in terms of sets. Each answer choice is “a part” of a superset. Hence, the negated statement = Super Set – Space occupied by the answer choice. Let’s take an example answer choice. Q: What is the super set? All 100 test takers who take the exam after 1 month of preparation perform better than they did on their first mock. Not All test takers who take the exam after 1 month of preparation perform better than they did on their first mock. Some Test Takers who take the exam after 1 month of preparation perform better than they did on their first mock. Most test takers who take the exam after 1 month of preparation perform better than they did on their first mock. Less than 50% of test takers who take the exam after 1 month of preparation perform better than they did on their first mock. No test taker who takes the exam after 1 month of preparation performs better than he/she did on their first mock. There are a few things to note in the picture above. 1. Understand the Super Set: Note, we are only talking about a segment of the population – the test takers who take the exam 1 month after preparing for their GMAT. This is our Universe or the super set. We are not concerned with test takers who take the exam after 15 days of preparation or 2 months of preparation. Words such as “Who” (user for people), “that” (animals, corporations etc. ), “which” and “those” have a segmentation effect. Therefore, any answer choice that deals with choices outside this segment – the segment in which people take the exam after 1 month of preparation – is incorrect. Take Away: Words such as Who, that, which, those etc. have a segmentation effect. 3. 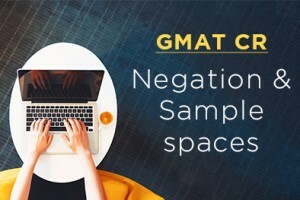 Understand what negation means: Negation or logical negation means that you select an answer choice that occupies the sample space that excludes the original choice. If it maps to another term above, then perfect, otherwise you may make the use of word “Not” to find the logical opposite. In the example above, the logical opposite of “All” is “Not All”. Note, that you may be tempted to use “Some” but “some” includes All (Notice, it includes 100) and hence is not the logical opposite. Here is a table of logical opposites. Some Test Takers who take the exam after 1 month of preparation perform better than they did on their first mock. Incorrect: For the reasons discussed above. Notice “some” = 1-100 whereas we are looking for a sample space of 0-99. Hence, this choice is not correct. Not All test takers who take the exam after 1 month of preparation perform better than they did on their first mock Correct: This is the correct choice. Notice, how this occupies the complementary sample space and is the logical opposite. WHAT IF YOU NEGATE THE VERB? Let’s bring the Original choice again for clarity purposes. Neg 1: Some GMAT test takers who take the exam after 1 month of preparation do not perform better than they did in their first mock. What does the above answer choice mean? Take Away: It is sometimes possible to negate by either negating the subject of an answer choice or by negating the Verb. Most GMAT test takers who take the exam after 1 month of preparation do not perform better than they did in their first mock. All GMAT test takers who take the exam after 1 month of preparation perform better than they did in their first mock. No GMAT test taker who takes the exam after 1 month of preparation performs better than they did in their first mock. At least half of GMAT test takers who take the exam after 1 month of preparation perform better than they did in their first mock. Up to half of GMAT test takers who take the exam after 1 month of preparation perform better than they did in their first mock. Up to half of GMAT test takers who take the exam after 1 month of preparation do not perform better than they did in their first mock. Half or more of GMAT test takers who take the exam after 1 month of preparation do not perform better than they did in their first mock. Innovations such as iPhone do happen outside Apple. Innovations such as iPhone do not happen outside Apple. No other company is as innovative as Apple is. Innovations such as iPhone happen both inside Apple and in other companies. No sane person who has ever given a ride to a stranded passenger will give a ride to someone dressed in a hood. Every writer will not tell you: first, find a good café. No writer will tell you: first, find a good café. Most writers will not tell you: first, find a good café. Not everyone who became sick got vaccinated. Most people who did not get vaccinated did not become sick.